You can bet your Miniature Schnauzer is! But before you let your your Miniature Schnauzer jump in the car and take off, you need to get prepared for the adventure. Planning in advance and packing the right supplies will make for a much better trip. So be sure to review all our travel tips below. when traveling with your dog it's not a good idea. You could end up at a beach that doesn't allow dogs, or find that there are no available hotel rooms that permit dogs to stay there. Trust me, things will go much better if you plan in advance. 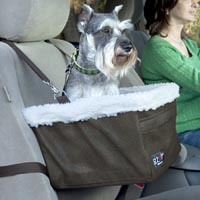 • Destination: Make sure your destination is a dog friendly place so you and your Miniature Schnauzer will be welcomed. 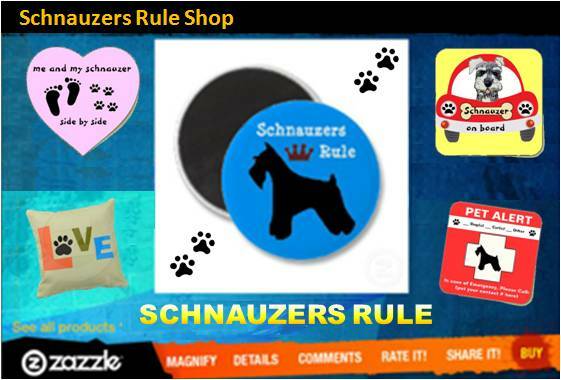 • Pet ID Tags: Make sure your Miniature Schnauzer's dog tag information is up-to-date, as well as, the registered contact info of your Miniature Schnauzer's dog microchip (if he has one). This includes contact information, as well as your Miniature Schnauzer's current rabies tag. Take along a photo of your Miniature Schnauzer with contact information just in case your Miniature Schnauzer gets lost. How to Find Your Lost Dog. PLUS, if your Miniature Schnauzer is on any medication, make sure to take it with you, too! • Fist Aid: Prepare a dog first aid kit to take with you. And make sure you've programmed your Vet's phone number into your cell phone in case you need to reach him right away because of an emergency situation. Your Dog First Aid Kit for Travel is basically a smaller version of the same necessities stored in your at-home pet first aid kit. Gather the following items and store then in a zip-lock plastic bag or cosmetic case and keep it in your car. It's also a good idea to call your visiting destination and ask them if there are any particular area dangers (like snakes, poisonous plants, etc..) that you need to be aware of. This will help you better prepare for these types of emergencies in your travel first-aid kit. • In the Car: Some dogs are very nervous or stressed when traveling in a car. If this is the case with your Schnauzer, many people have found that a thundershirt has helped calm their dog's anxiousness or perhaps you might want to try a calming aid to help your dog. Just remember to consult with your Veterinarian first. And remember to NEVER leave your dog alone in the car! It's just not safe. Even if the temps are mild, dog thieves are always lurking about as pet-flipping has become the new quick rich scheme. Time for your road trip! Be sure to stop every 2 to 3 hours and let your Miniature Schnauzer relieve himself, have a good stretch, and get a refreshing drink of cool water. 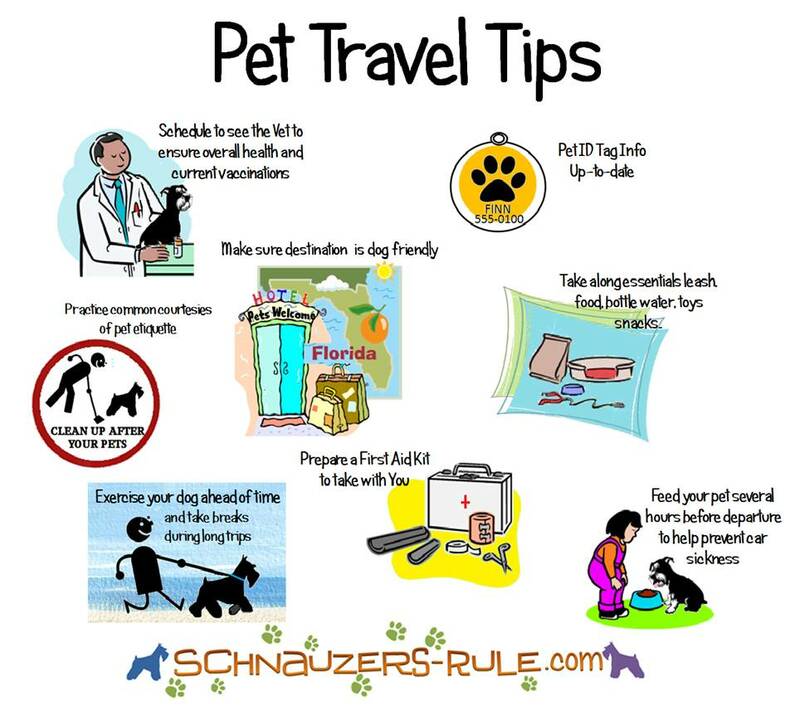 Hopefully, by following these dog car travel tips, you will have a great experience traveling with your Miniature Schnauzer. Your Miniature Schnauzer will love exploring the great outdoors and spending time with you. Traveling with your furry companion makes for a great bonding experience. Chronicle your life and times spent with your Miniature Schnauzer with great pictures and videos, with an easy-to-use, affordable digital camera. Snap as many pictures as you want and create lasting memories. You'll want to make sure you capture these special times with your Miniature Schnauzer with pictures and videos. Your road trip pictures will be great for a Miniature Schnauzer dog scrapbook or memory album, entering dog contests, creating custom dog art, and lots more! The possibilities are endless! But you have to take the pictures first. Traveling by Plane with Your Miniature Schnauzer? If you will be traveling by air with your Miniature Schnauzer, keep in mind not all airlines accept pets for travel. Also, contact your airline directly to get all the details and information on traveling with your furry companion. Get the basic information on domestic and international travel of pets from the USDA Animal and Plant Health Inspection Service. note: If for some reason you are not able to take your Schnauzer with you on a trip be sure to read our dog boarding tips before choosing a boarding facility or kennel to car for your dog or perhaps hiring a pet sitter would be a better option for you. "Knowledge Share"... If you found this page on Car Travel Tips for Dogs helpful and informative, please share it with your dog-loving friends by clicking on one of the share links (like facebook, twitter, and google +1) located at the top right or bottom of this page.